1. Very aggressive pricing on the newly enhanced 528 and 530 SpectroDensitometers. These units now have G7 and ISO values, as well as the Digital Coated Pantone Library, pre-loaded. They come with a three-year warranty, and are ideal for customers who need to read Delta-E and CIE L*a*b* values, or who have adopted G7 methodology. This represents a breakthrough price on this proven technology, and will not be extended past this quarter. As a bonus, by popular request 528’s and 530’s are now offered in a dark gray color! As a reminder, the 530 exports the spectral data, and can therefore interface with X-Rite software for advanced Color Quality Assurance and Ink Formulation applications. 2. Trade-in’s for D19-C users. Users of the “Gretag MacBeth” D-19C densitometers can trade them in on the SpectroEye, 528, or 530! The SpectroEye is a high end handheld SpectroDensitometer, with the “extendable head” measurement technology and easy to use, “roller ball” user interface also featured in the D19-C. This is also ideal for those customers wishing advanced colorimetric technology or who have adopted G7. Like the 530, the SpectroEye can also interface with X-Rite software for advanced Color Quality Assurance and Ink Formulation applications. Further, the SpectroEye features “BestMatch” functionality, which recommends the best density values for minimizing Delta-E. This feature alone provides fast Return on Investment for many users. 3. 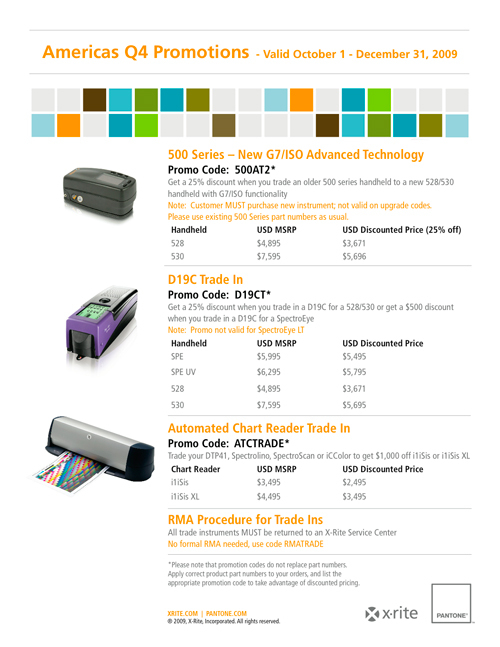 Trade-in’s for prepress chart readers. Users can trade in their old DTP41 strip readers, Spectrolino Spectroscans, or iCColor chart readers on the current i1iSis units for a $1,000.00 discount off of MSRP. The i1iSis reads faster, and features an advanced bar-code reading feature to help users better manage their targets. When used with the current versions of MonacoProfiler or ProfileMaker software, the i1iSis also features Optical Brightener Compensation (OBC) to help users better control for the effect of optical brighteners in their substrates when profiling. In addition, X-Rite successfully launched the “EasyTrax” low cost scanning densitometer/spectrophotometer for sheetfed printing operations up to 40” at the recent Print 09 trade show. Densitometric versions of the EasyTrax start at only $10,995.00! This device represents a real breakthrough in pressroom scanning technology, and we anticipate shipping these devices later this quarter. I would be delighted to speak to any of your customers who are interested in improving quality while reducing waste and makeready about this exciting new unit.